Between 15 and 20 August 2014, we completed a medium-size venture entitled Bordering on Madness. This primarily involved travelling the length of Hadrian's Wall - the historic boundary between England and Scotland - playing at a variety of interesting places along the way (including Wallsend, Castle Keep in Newcastle, Hexham Abbey, Lanercost Priory, Carlisle Cathedral and others). However, we also took in the England-Wales border, playing on top of the tower of Chester Cathedral (which we had not managed to do during the Cathedral Roof Tour, due to a restoration project). Although not a sponsored challenge, along the way we did collect plenty of money for one of our favourite charities, Aspire (who provide help and rehabilitation for people with spinal cord injuries). The full story of Bordering on Madness, as told on our blog at the time, is repeated here. We're all now in Chester and raring to go! We warmed up this evening with a public open-air rehearsal in an open space near where James lives; given the length of time since our last challenge things were surprisingly not too rusty, and so we're looking forward to performing over the coming days in all sorts of places. As well as our standard repertoire, we've added two new pieces for this trip: "Bordering on Madness" a medley of six hits by the '80s group Madness, and "Wonderwall" by Oasis. Obviously both have clear connections with this particular challenge, in name at least! - we'll go back up the Cathedral at in the early afternoon, before heading off to the north east to start Hadrian's Wall on Saturday! Highlight of the day: discovering we could play our new pieces relatively well! The end of day 1 - today we did the Chester leg of the trip, which involved us playing at the top of the Cathedral twice, as well as some other places! We started by ascending the 240-odd tower steps, and playing (in the drizzle) while the 10am cathedral tour came round. It was good to get some of our old repertoire in the open again - not least "Up on the roof" by The Drifters, which we last played in 2006! After this we did a whistlestop tour of a few places in Chester - including the city walls, the Roman amphitheatre, and a bandstand by the river Dee. After this we returned to the cathedral to play in the refectory dying lunchtime, before dashing up the tower for a second time to entertain another tour party! - we will also be playing in various other places, as yet undetermined - but we'll tell you all about these tomorrow! Today was all about the Newcastle region as we started Hadrian's wall and did a few other bits and pieces in the region! Then onto Wallsend - the actual start (or end) of Hadrian's Wall. We didn't pay to go into the museum, so gave our performance of "Wonderwall" at the nearest spot in the adjacent car park! 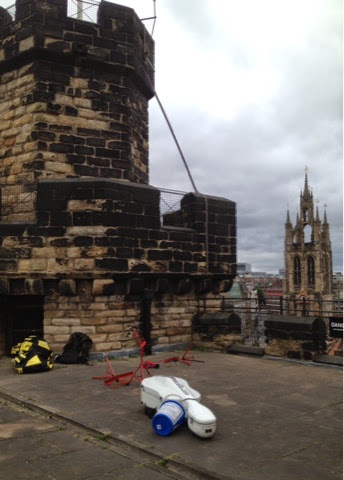 After a bit of lunch we then went to play on the roof of the Castle Keep in Newcastle. It was rather blustery, resulting in some music stand carnage (see picture below)! After nearly getting frozen to death we went down and played in the Great Hall instead - a fantastic acoustic. A bit of busking by the Tyne (oh, we do like to be beside the quayside...) and a look round the wonderful Sage in Gateshead followed - many thanks to the wonderful employee who gave us a private guided tour! 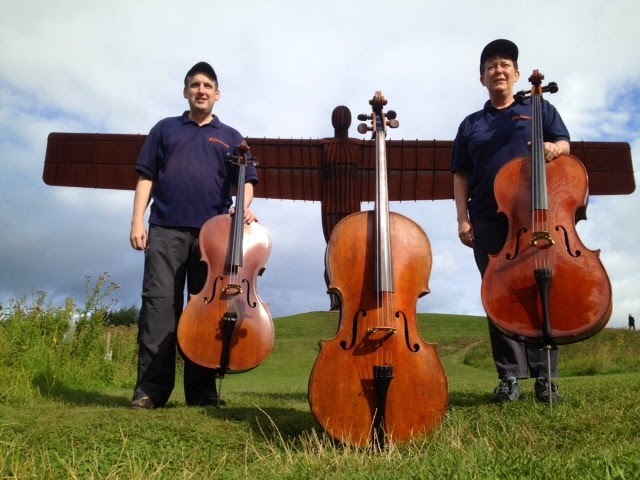 Then back to Tynemouth for our gig... which involved us playing in the middle of King Edward's Bay, playing for a group of kayakers who had just arrived into shore, whilst fish was being barbecued to our left! A lovely way to spend a sunny (if chilly) Saturday evening! Tomorrow we're playing for the morning service at Hexham Abbey (10am) and then possibly elsewhere in Hexham, before joining the wall a few miles north of there in the afternoon. Highlight of the day: playing for the kayakers at King Edward's Bay in the evening. Today we bade farewell to Durham (where we had stayed the last two nights) and travelled the 45 minutes to Hexham - close to Hadrian's Wall and home to a wonderful abbey, where we had arranged to play before, during and after their main Sunday morning service. 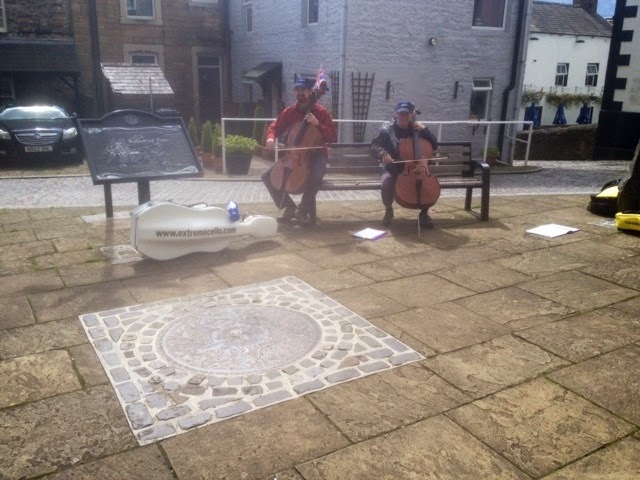 We enjoyed a very warm welcome from the fabulous people of Hexham, who seemed to appreciate our playing immensely (and were very generous in their giving towards our charity, Aspire). 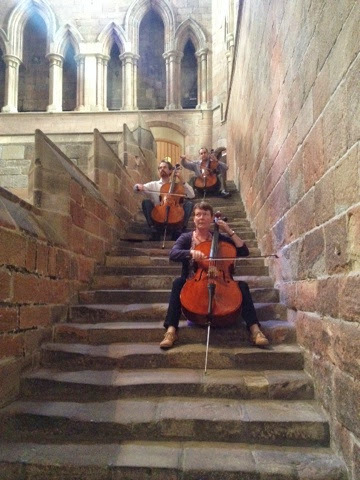 At the end of the service we also played on the ancient gallery steps and in the 7th century crypt (see pictures below) - this was quite a squeeze! After a spot of lunch we found the path of Hadrian's Wall itself, and gave ourselves a brisk 8.5 mile walk between Chester's Roman fort and the Brocolitia fort to the west. 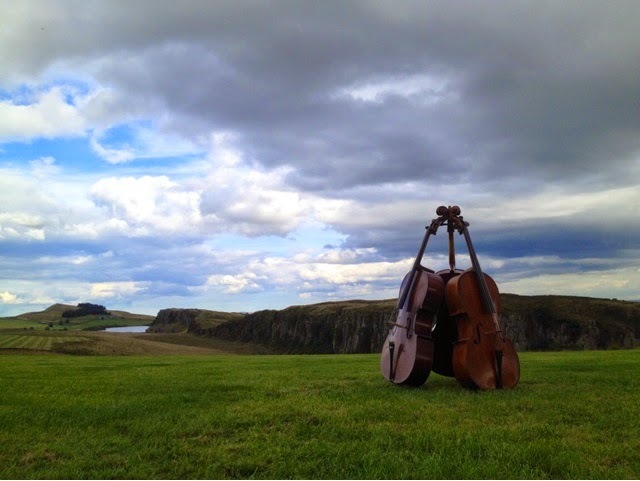 It has to be said, it was easy to forget how difficult it could be walking with a cello uphill into a strong wind - and how easy it is doing the opposite! The cello acts as a sail somewhat, which can be used to our advantage at times, but is certainly a hindrance at others. Now we've moved onto a new base in Carlisle where we will stay until Wednesday - but we'll be exploring far and wide. Tomorrow we play at Lanercost Priory at 10.30am, and will then cover some sections of the wall to the east of there for the rest of the day. First, however, we're about to go for our fourth curry in as many days - yes, this has become part of the challenge and we'll let you know which our favourite was at the end! 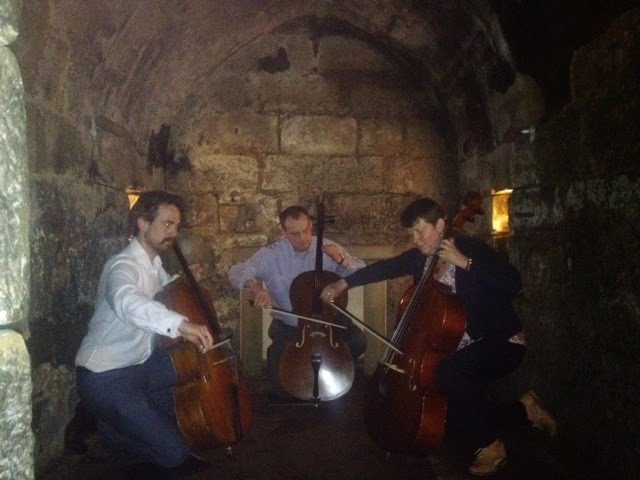 Highlight of the day: Playing in the 7th century crypt at Hexham Abbey. Today started with a slightly more leisurely breakfast - possibly necessary after last night continued after the now customary curry to a bar where we participated in bingo for the first time in our lives! 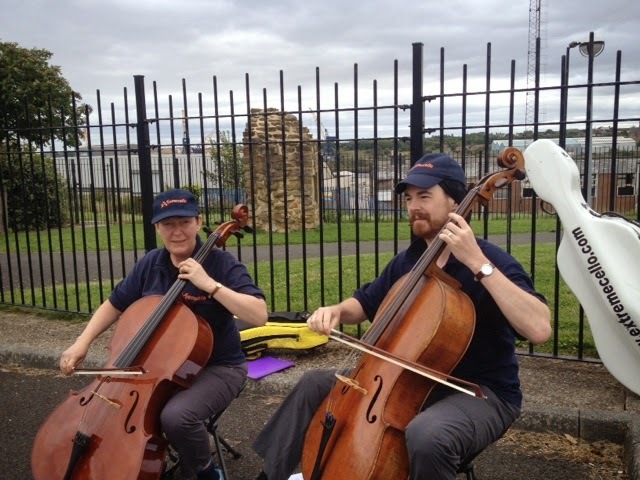 However, who we got onto the cello activities, the first was an absolutely glorious one. Playing in the 12th century Lanercost Priory, we had a much larger audience than we hade dared hope for, and we gave a performance lasting about 40 minutes. The fantastic setting and acoustic made this one of the highlights of the trip to date. Many thanks to all at Lanercost for making this happen! After a coffee, we set off for Haltwhistle - the central point of Britain. We played for a while in the central square (below), before grabbing our lunch and heading off to Hadrian's Wall once again. Our walking today consisted of a stretch of a few miles to the west of Housesteads fort. It was spectacular scenery, and included a significant amount of climbs and descents, sometimes fairly steep. 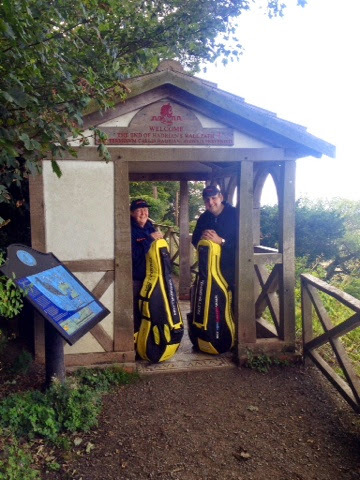 We played at the highest point of the whole of Hadrian's Wall - at 385m not the highest place we've played certainly, but it still felt like enough of an effort today! After this we visited the wonderful Twice Brewed inn to play a bit more (and to sup a local pint! ); once again we were bowled over by the generous welcome we received. Now we've returned to Carlisle, and will shortly be heading out for yet another curry! Tomorrow we will play at various places in and around Carlisle in the morning, getting as close to the Wall as we are allowed... and in the afternoon we hope to cover the remaining distance of the Wall (not on foot!) and play at the western end of it. Highlight of the day: a joint one - playing at Lanercost Priory, and also playing at the trig point at the top of the route (see picture, left). In both places we had surprisingly large, appreciative and generous audiences. Another fantastic day, and a varied and different one from what had gone before! We spent the morning in Carlisle, playing at four different locations close to Hadrian's Wall itself. We started outside the cathedral - reprising our location from the end of the Cathedral Roof Tour in 2006! 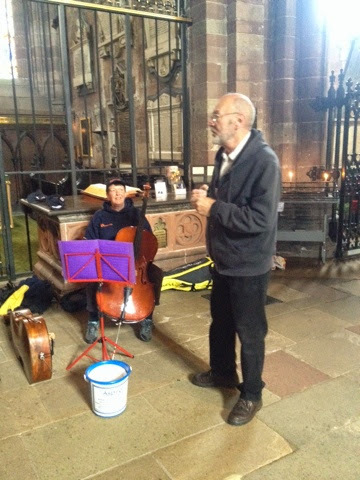 After this we were given permission to play three pieces inside the cathedral as well - meaning we had now finally played in, or on, all 42 Anglican cathedrals in England! After this we played in the nearby Tullie House gardens, and then outside the Castle - we were not given permission to play inside unfortunately. However, this was rather fortuitous as we happened across a small adventure playground just outside, and James had a go at ascending a climbing wall with his cello (see left). Many thanks to Mike Gair and all at Urban Adventure Carlisle for allowing this to happen! After a spot of lunch we decided to head up over the proper border, and made our way to Gretna Green. After playing at the famous blacksmith's, we went see a wonderful project on the actual border: the "Hands across the border" campaign which is promoting UK unity ahead of the Scottish referendum in September. In only five weeks, they have already manage to build a massive cairn by asking volunteers to add a stone at a time, right by the River Sark (the border itself). Of course we played at the cairn, giving another outing to our "Bordering on Madness" medley amongst others. After this we moved on to the end of Hadrian's Wall itself, at Bowness-on-Solway. We played in a promenade constructed to mark the end of the Wall (see below), before going down onto the beach and playing "Oh, I do like to be beside the seaside" an enjoining a beer that had been bought at Lanercost yesterday. A most serene and glorious way to end the main part of this year's challenge. And so, we have reached the end of the wall and the "Bordering on Madness" escapade itself. But we haven't quite finished this year's tour... check back here tomorrow to see what further ventures await us! Highlight of the day: Enjoying a beer on the beach at Bowness-on-Solway, looking at the sun over the Scottish hills to the west. Quote of the day: "It would be great if you could come and play on our tour" - Rick Kemp of Steeleye Span. Day 6: Bordering on Madness No More! ..and there we go, another challenge is completed! But there's a bit more to tell first. To begin with, as regular blog readers will know, one aspect of Bordering on Madness was that we decided to have a curry on each of the six nights of the tour. Last night we were treated to a home-cooked one by an old friend, Mary, who lives locally in Carlisle. A wonderful way to spend our final night on tour! I promised there would be some comparison of the curries we ate... obviously the home-cooked one was the best, so it's not fair to compare that with those from the five other establishments we patronised, but of the other five the favourites were Shaheen's in Durham (rated best by Jeremy and Clare), and the Stanwix Tandoori in Carlisle (rated best by James - a particularly good Lamb Dansak). Well done to both places, and thanks to the other restaurants we visited too! Bordering on Madness wasn't a sponsored event, but with some intermittent busking we still managed to raise over £300 (£304.97, to be precise) for Aspire, and are pleased to continue our association with this fantastic spinal cord injury charity. Finally, a special "thank you" to everyone who helped this happen... particularly to all at Chester Cathedral, the Castle Keep in Newcastle, Hexham Abbey, Lanercost Priory, the Twice Brewed Inn, Carlisle Cathedral, Tullie House, Urban Adventure Carlisle, and the "Hands across the Border" project in Gretna - as well as everyone who supported us or donated to Aspire.